Leader Internet are an Irish Software Development Company specialising in SaaS, Apps and Websites. We have 12 years experience designing, architecting and building online systems for multinationals, global brands, SMEs, startups and state organisations. We are proven experts on Software Development, Web Performance and Technical SEO. We preach Lean Startup, getting a Minimum Viable product out the door, learning from it quickly and then iterating at speed. Our team will work alongside yours to implement this technique, build at pace and close the feedback loop so your are pushing updates to your customers every single day. Our experts will transform the way your team builds software so you learn what doesn't work and change it quickly. Our senior consultants provide quality insights at all stages of the software development lifecycle from idea creation and refinement to analysis and design. We stay by your side for all phases of product development, testing and deployment. Leader operate out of Dublin with offices in the UK and Spain. We have clients around the globe that benefit from our savvy knowledge of the online ecosystem and depend on Leader to steer their technical direction. You have made a smart move toward accelerating your Web Project. Now get in touch and Leader Internet will help you take the next step. 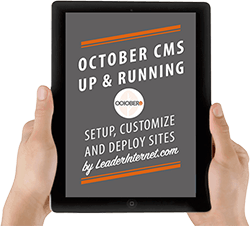 Our Award winning October CMS eBook is the complete guide to setting up and developing an October CMS site quickly.